Solar-leasing companies are expected to lose business over the new, lower export rate for TEP solar customers. New Tucson Electric Power solar customers will get lower credits for excess solar-energy production and pay slightly higher monthly meter fees under a long-awaited decision by the Arizona Corporation Commission on Tuesday. Solar-industry advocates say the ruling will make solar uneconomical for many ratepayers and could cause the industry to collapse. After more than two years of deliberations dating to TEP’s last general rate filing, the utility panel voted 3-2 on Tuesday to approve new solar rates proposed by an administrative law judge in April. The new rate plan does not affect TEP customers who have already installed or applied to interconnect solar systems before the Corporation Commission’s decision. The commission’s ruling was in line with an earlier statewide policy decision to end net metering, or reimbursing rooftop solar customers for excess energy production at the full retail rate, and to adjust rates and charges to avoid shifting costs to non-solar customers. For new solar customers, the ruling replaces net metering with a solar “export rate” based on the cost of energy from utility-scale solar farms over a prior five-year period. Tuesday’s ruling sets an initial TEP solar-energy export rate of 9.64 cents per kilowatt hour compared with net metering at a retail rate of 10.8 cents, locked in for each customer for 10 years from the time their systems go online. The export rate will be reset annually based on a five-year rolling average of utility-scale solar costs, subject to a maximum 10 percent annual decrease. For UNS Electric, TEP’s sister rural utility that serves Santa Cruz and Mohave counties, the new export rate will be 11.5 cents per kilowatt hour, initially higher than the rural utility’s average rate of 9.2 cents but subject to annual decreases. Michael Patten, an attorney representing TEP and UNS, questioned the initial UNS export rate as excessive because it was based on some expensive utility-scale solar acquired by UNS as far back as 2011. UNS serves about 95,000 electric customers in Santa Cruz and Mohave counties. But the commission’s staff said the proposed export rate resulted from the formula prescribed by the commission, and no commission member moved to change the rate in the order. New TEP and UNS solar customers also will have to pay a higher monthly meter fee of $2.23, while small-business solar customers will pay a monthly meter fee of 90 cents, up from $2.05 and 35 cents, respectively. The fees were recommended by solar-industry representatives after TEP asked for a monthly residential meter fee of $3.50 and a small-business fee of $5.62. The commission also rejected proposals by the utility to impose grid-access fees on solar customers based on the size of their systems. In the end, neither the utilities nor the solar industry got exactly what they wanted from the commission. Though the initial solar export rate was close to TEP’s original proposal, TEP and UNS wanted to recover more from solar customers to counter a cost shift to non-solar customers. “We’re pleased to have a decision that preserves generous bill savings for customers who want to go solar while reducing cost burdens placed on other customers,” TEP and UNS spokesman Joe Barrios said in a prepared statement. Solar-leasing companies, which typically offer relatively small monthly savings for customers, stand to lose most from the commission’s decision. An official of one of the nation’s biggest solar-leasing companies said Tuesday’s decision will make its business model untenable in TEP territory. 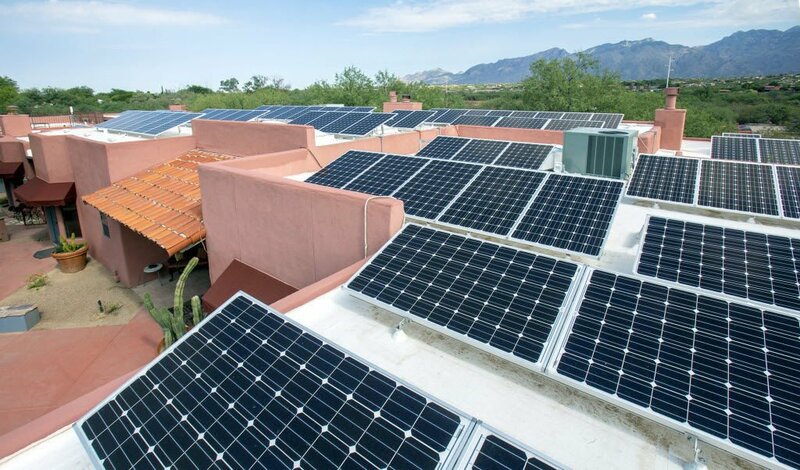 “We are disappointed by the Arizona Corporation Commission’s decision, which will make it impossible for Sunrun to continue selling solar in the Tucson area,” said Jessica Reinhardt, director of public policy for San Francisco-based Sunrun. Local solar installers say the solar export rates will push the payback period for most customers who buy systems past the 10-year mark, making it uneconomical for many. Nationwide, residential solar installations financed by loans are expected to surpass leased systems this year, with cash purchases falling to the third most common acquisition method, according to GTM Research. The ACC order does not include new individual rate plans for solar customers, after the administrative judge found the utilities’ cost studies were flawed and ordered the companies to submit data to support new plans. Customers applying to connect their new solar systems after the official day of the rate decision, which was expected to be signed and filed Tuesday or Wednesday, will be able to choose from any current time-of-use plans offered by TEP and UNS. TEP and UNS customers who applied to connect solar systems before the decision becomes final will continue to benefit from net metering and keep their current rate plans. The solar-rate cases for TEP and UNS were considered together, though the commission voted on separate orders for each utility. Commission member Andy Tobin and Chairman Tom Forese voted against the proposed solar order for TEP, without explaining their votes. The UNS order passed 4-1, with Tobin dissenting. When the case last came before the full commission in June, Tobin had proposed a plan that would have further cut energy export credits and impose grid-access and meter fees on solar customers, based partly on rates decided last year for Arizona Public Service Co.
Tobin backed off after solar industry representatives said his plan would kill the solar industry, and the matter was tabled at his request while he gathered more information. Other provisions of the order approved Tuesday direct TEP and UNS to pilot new solar-related programs. Within 120 days of the decision, the utilities must propose special rates for solar customers who install battery systems and other “behind-the-meter” energy-saving technologies such as load controllers. The pilot programs would be capped at 4,000 TEP customers and 1,000 UNS customers. TEP and UNS had opposed the program, contending that customers using such technologies would benefit under current rate plans. TEP won approval for its proposed Residential Community Solar program, which allows homeowners to sign up for 10-year contracts to buy solar energy from a new TEP- or third-party owned 5-megawatt solar plant. Solar-industry representatives had opposed the program, contending, among other things, that it would create unfair competition to private solar providers. The utility will release more information on the programs in the coming months, Barrios said. Adopting a proposal by the state Residential Utility Consumer Office, the commission ordered TEP and UNS to propose pilot programs offering higher solar export rates during periods of peak demand for rooftop solar systems that face to the west, since such systems contribute more much-needed energy to the grid during late-afternoon and early evening peaks. What can you recycle in Tucson and what should you just throw away?